Whether you’re looking for an easy way to stay in ketosis while on-the-go, trying to lose weight or just want a tasty, guilt-free snack, protein bars can make being on the keto diet easier–and more pleasurable. However, finding a good keto protein bar is not easy. There are literally hundreds to choose from, and from low-carb to meat (??) to collagen bars, there’s a wide variety of options. Most protein bars are not keto-freindly, and even those that are technically keto-approved are often garbage and will actually harm your heath. Read on to learn why, and where to find real keto bars that are actually healthy. 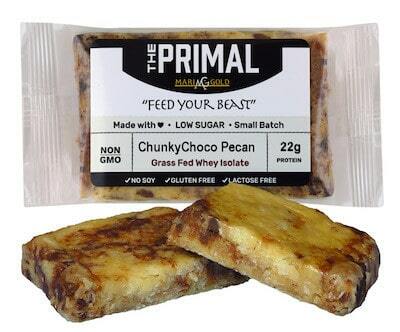 The vast majority of popular low-carb protein bars are not fit for consumption with any kind of regularity. Higher-than-advertised net carb counts, sugar alcohols, low-quality protein, synthetic fibers, inadequate fat, preservatives, and poor taste and texture make them unhealthy–and unappealing. You should avoid most of them at all costs. 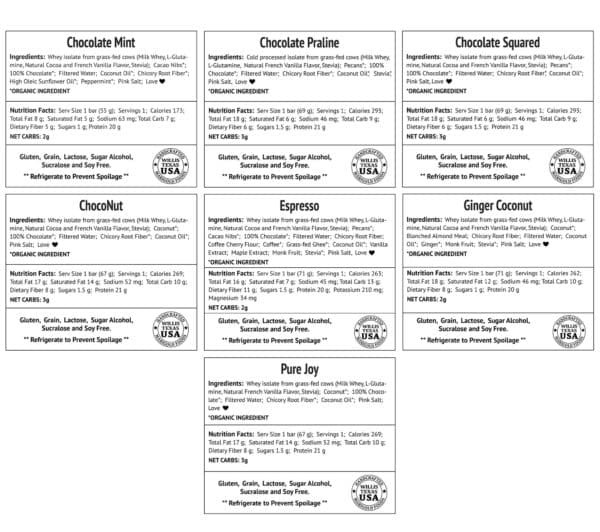 I’ll get into specifics in the individual bar reviews further below. In this post I am going to go beyond macros and net carb counts and show you keto-friendly protein bars that are nutrient dense, nourishing and delicious – healthy options that you can safely eat as often as every day. I’m talking about bars that include superfood fats (MCT’s and Omega 3’s), grass-fed whey protein and natural fiber–and exclude sugar alcohols, GMOs, preservatives and other disgusting synthetic ingredients. All while tasting incredible. My research included venturing deep into the underworld of low-carb protein bars, looking at best sellers on Amazon, and in the aisles of Whole Foods and Trader Joe’s. A lot of what I found disgusted me, frankly, and I’m not going to be shy about it (I hope my rant against Quest Bars does not get me into trouble). The good news? I also found some fantastic options that I am delighted to share with you. The Internet is littered with articles reviewing various keto bars and not a single one uses a compelling framework for rating them objectively. In the comparison chart below you will see that I have done just that, evaluating eight key attributes that translate into a five star rating scale. 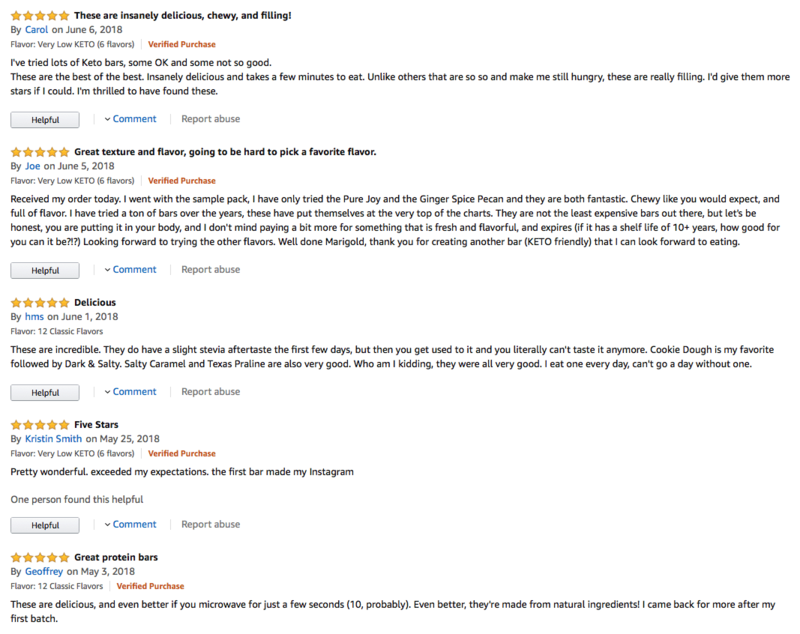 In addition to ingredients, macros and nutrient density, I looked at Amazon reviews as a proxy for taste and quality, assuming that anything that got over four stars likely will please the majority of people. I recommend taking a good look at the comparison chart that follows, and then scrolling down for a deep dive into whichever bar catches your fancy. But if you’re feeling impatient, you can use the list of keto protein bars below to jump ahead to individual reviews. Bon appetite! 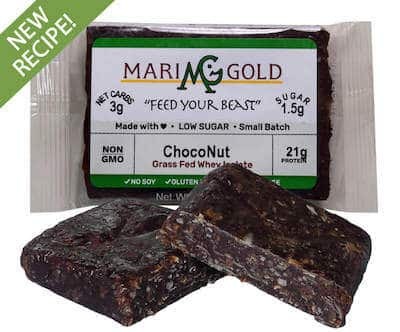 MariGold Bars, one of the many tasty keto-friendly protein bars I discovered. Perfect Keto Bars are delicious and (mostly) live up to their name. There are literally hundreds to choose from, and from low-carb to meat (??) to collagen bars, there’s a wide variety of options. 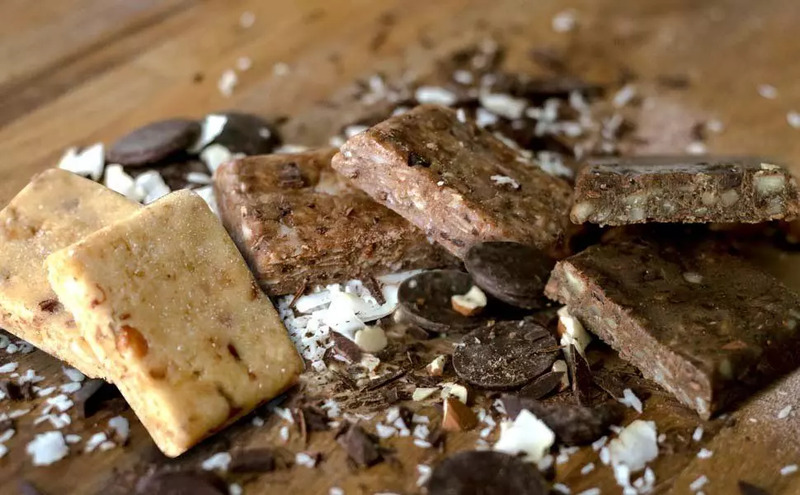 Most protein bars are not keto-freindly, and even those that are technically keto-approved are often garbage and will actually harm your heath. Read on to learn why, and where to find real keto bars that are actually healthy, like this one. 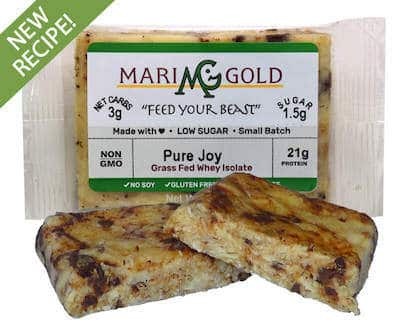 Hand crafted in small batches and made with love, MariGold Bars look and taste like they came from your own kitchen. They’re the only bar that got a a perfect score, easily earning 5 stars. Their unique recipes, delicious taste and commitment to healthy, clean ingredients have earned them a passionate and loyal following. 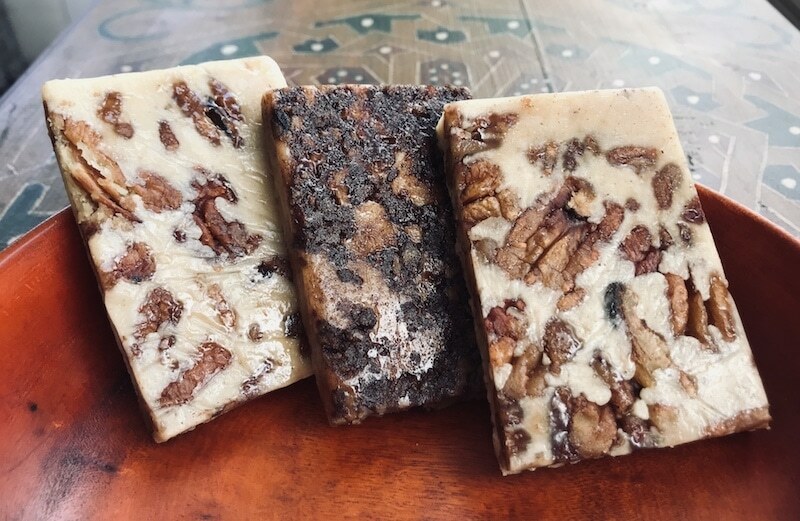 I recommend that newbies start with the Very Low Keto Pack, which is a sampler containing Coconut Rage, Ginger Pecan Spice, Choco Pecan and Dark & Salty, my personal favorite. I posted a full gallery with photos of all the best keto options, as well as Amazon reviews, at the very end of this article. Use promo code HFB10 to get $10 off! Way more keto-friendly flavors than any other brand – you’ll never get sick of these bars! May seem expensive for some, but the value is definitely there. Use promo code HFB10 to get $10 off! One of the most popular brands on the market, Perfect Keto bars are an excellent choice if you like nut butters and don’t require high protein content. They still pack 10 grams, and some of it is from Grass Fed Collagen (loaded Conjugated Linoleic Acid, and more). But, that’s only about half of what most other bars have. If you like lots of fat these bars are for you. They have a higher percentage of fat calories than most other bars, and have MCTs. But, most of the fat is still from nut butter, which is not as nutritious as other fats. Buy them on www.perfectketo.com and get 15% off with promo code HFB25. May seem expensive for some, but they’re worth it. Use promo code HUMANFOODBAR to get 15% off! I think they’re delicious, but judging by Amazon reviews, which range from 3.5-4 stars, not everyone may like the flavor and texture. The original bar that created the category, Keto Bars don’t disappoint. 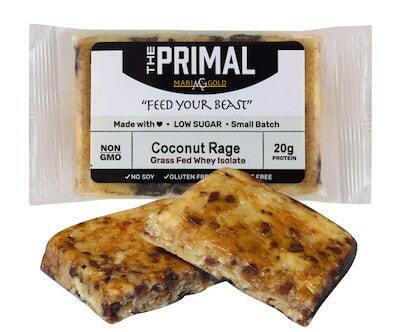 They’re mostly fat so they will help keep you full and in ketosis–packing both nuts and coconut oil, they have more fat than any other bar. Assuming you like nuts and chocolate, they’re absolutely delicious. 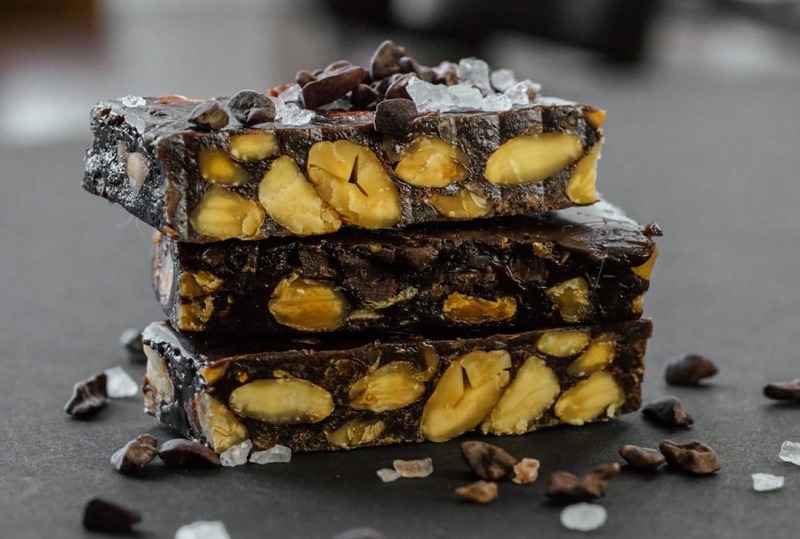 Whether you prefer peanuts or almonds, you’re going to love these bars. Macros: 250 calories, 21g fat, 8g protein, 3g net carbs. 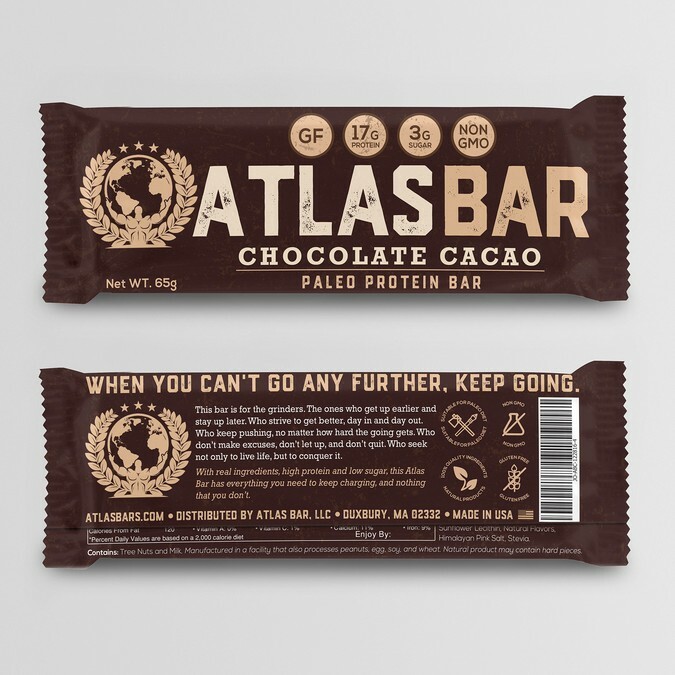 Atlas Bars might be the right choice for you if you adore Reeses Peanut butter cups and are missing them while on the keto diet. Their rich flavor may make them tasty, but they’re sorely lacking in healthy fats, with the only source being nut butter. Additionally, only about 40% of their calories come from fat, which is less than ideal for keto. These may not bad for you, but why settle? There are other options that contain grass-fed ghee (Omega 3’s) and coconut oil (MCTs). Don’t eat these with regularity. With the great sucess of Bullet Proof coffee, it’s tempting to believe that these bars must have something special going on. Loaded with grass-fed collagen and added MCT oil, they’re nutrient dense. However, they only have 5g of fiber and lots of cashews, leaving them with a relatively high net carb count of 7g that could easily kick you out of ketosis. 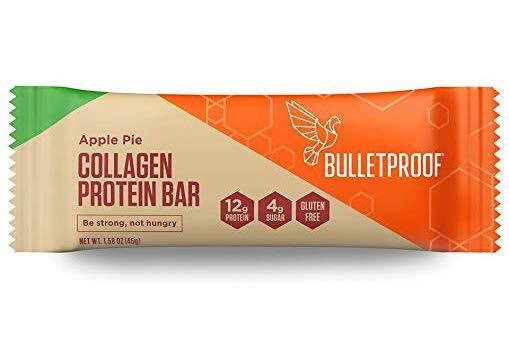 Taste is always somewhat subjective, but with 3.5 stars on Amazon, there are plenty of people who are just not that into Bulletproof Collagen bars. These are definitely not the most keto-friendly protein bars. Unless you’re extra hot for collagen and MCTs, you can do better. Julian Bakery is a rather unusual brand that has come up with some odd products over the years, including some of the first meat bars. 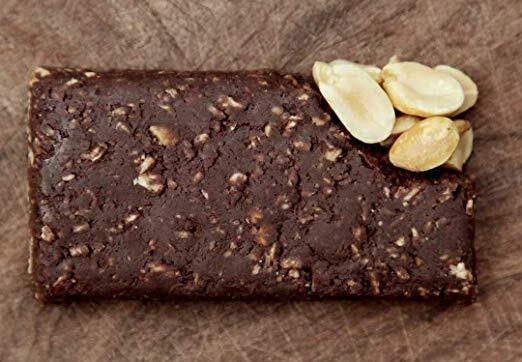 They seem to miss on taste and texture most of the time, and this low-carb protein bar is no exception. It’s basically just a hunk of grass-fed whey protein with a ton of tapioca starch. And I do mean a ton: there’s 18g of resistant fiber in this modest 130 calorie bar. If you can tolerate 18g of tapioca starch without getting a stomach ache, it’s possible that this bar could be good for your gut bacteria (they feed off resistant starch). The super low net carb count may make this seem like an excellent option for keto, but it’s sorely lacking in far which means you’re going to be left hungry. Like Julien Bakery’s other products, I don’t really understand this bar. Stoka’s motto is “More krunch, less carbs”, and it’s crunchy texture is about the only thing that makes this protein bar stand out. In fairness, there are some people who don’t like their keto bars to be chewy. But unless you’re one of them I’d encourage you to move on–there’s nothing to see here other than sugar alcohols, almonds and almond butter. Stoka Bars have erithritol, which means their true net carb count is slightly larger than claimed. And they don’t have a lot of protein. This is a good reminder that just because something looks natural doesn’t mean it’s the healthiest choice. Macros: 250 calories, 22g fat, 9g protein, 6g fiber, 7g net carbs. Let me be honest: there’s no low-carb protein bar I hate more than Quest Bars. It’s the perception that they’re a healthy choice that bothers me the most. If you’re trying to eat well, the fact that they can be microwaved and then successfully reconstituted into cupcakes, cookies and crepes tells you everything you need to know 😂. 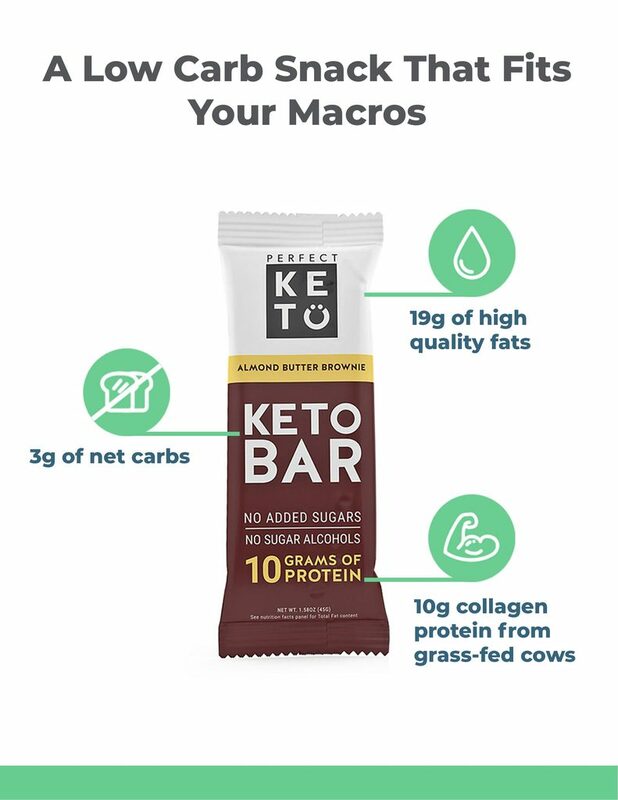 I still included them in my list of the top 10 keto bars because, due to Quest Nutrition’s marketing prowess, they’re extremely popular and I know people are wondering about them. I think folks should be educated about why they’re a bad choice for keto (and for any diet, for that matter). There’s a wide misconception that Quest Bars are keto-friendly because of their purported low net carb count. It’s actually higher than advertised because they’re sweetened exclusively with sugar alcohols, which are NOT completely indigestible, as claimed. Your body still absorbs some of them as carbs. This misleading marketing lead to Quest Nutrition being sued, and losing. The other reason Quest Bars are a very poor choice for keto is that they have inadequate fat. Only about 30% of their calories are from fat, and some or all of it is usually palm oil. They’re also loaded with artificial ingredients. Now, I will concede that Quest Nutrition has made some strides towards making more nutritious low-carb protein bars in recent years. But there’s still no good reason to make them your go-to keto bar unless you just can’t afford the real deal. If you must, slather a bunch of coconut oil or butter on, because they just don’t have enough fat. More Like Pure Garbage: Maltitol, Sucralose, Palm Kernal Oil Oh My! Low-carb protein bars are a minefield for keto dieters, because many people on the diet think that just being low in net carbs is good enough. Any bar that markets itself as low-carb is almost certainly a poor choice for keto. Yet, Amazon searches for “keto bar” return many such bars. This is definitely a problem. Pure Protein is a perfect example of a horrible bar that somehow sells well on Amazon, presumably because some like the taste (and may not realize they’re unhealthy). Seeing as it looks like a candy bar and contains copious amounts of maltitol and sucralose, I can’t say that I am surprised. It’s hard to imagine anything worse than a Quest Bar, but Pure Protein manages. It has less fiber and fat, and more artificial ingredients. Right when I thought things couldn’t get any worse, I came across One Bars, the worst low-carb bars availabe. Fittingly for it’s name, the One Bar gets just a single star. One look at the inside of this bar and you can immediately tell this is not going to be good for you. Popular flavors include Glazed Donut and Birthday Cake. Who eats these things?! They contain isomolto-olligosacharides (ISO), the fake and misleading fiber that Quest Bars got sued over. One of the many problems with ISO is that it’s partially digestible, increasing net carbs. One Bars also contain Carnauba Wax, which is what I use to polish my car (no, really). I included them here because, despite their inferiority, they’re selling well on Amazon and anyone in the market for a keto-freindly protein bar could come across them. Sadly, taste and price alone are enough to earn bars high ratings on Amazon. The problem is that the people these bars are being marketed to are trying to be healthy. Beware, keto friends: these could be the unhealthiest bars money can buy. Are keto bars good for weight loss? Definitely! The best keto bars will enable you stay in ketosis, and anything that does that is going to help you lose weight. As a bonus, most of the better keto protein bars out there contain MCT oil and/or coconut oil, which is known to help burn fat. Bars that have grass-fed whey protein and/or collagen are extremly high in Conjugated Linoleic Acid (CLA), which is has been scientifically proven to help with weight loss. What the Heck Is Isomalto-oligosaccharides? Isomalto-oligosaccharides (IMO) is the notorious synthetic fiber invented by QUEST Nutrition. It was purportedly not capable of being digested by the human gut, and was used to falsely reduce the net carb count on the labels of Quest Bars. The fiber became notorious when QUEST Nutrition was sued after it was found that IMOs are in fact partially absorbed. IMOs have a glycemic index of 35, which is comparable to Malitol, one of the least preferred sugar alcohols. Many low-carb protein bars are still using Isomalto-oligosaccharides. What this means for you if you’re on the keto diet is that you should avoid them. But if you must, you should take about 50% of the listed grams of fiber and add them back in as carbohydrates to your net carb count. Failing to count the carbs in these bars could really throw off your macros, especially if you’re busy and eating one every day, which can happen. Always scrutinize the labels! What’s Soluble Corn Fiber (SCF) and is it safe? As a result of the Isomalto-oligosaccharides (IMO) lawsuit, QUEST Nutrition eventually replaced IMO with Soluble Corn Fiber (SCF), another synthetic fiber that changed the taste and texture of Quest Bars significantly–to the dismay of many loyal customers. While there’s not much scientific research available on Soluble Corn Fiber yet, anecdotal evidence based on blood glucose testing suggests that it’s almost entirely indigestible (this is a good thing) and has a low glycemic index. Hence, you need only add back in about 10% of the list of carbohydrates on keto protein bars that are fortified with SCF. You’re still better off with natural fibers like inulin. What natural fibers should I look for? Chicory root and tapioca fiber are in many high-quality keto bars and they are generally considered to be safe from a net carb counting standpoint. And because they’re a prebiotic fiber, they’re great for feeding your healthy gut bacteria. How many protein bars can I safely eat daily on keto? It really depends on the bar and how much protein you’re getting from other dietary sources. If you’re eating a healthy, nutrient dense keto bar like MariGold or Perfect Keto, and your diet is diverse and well balanced, you can safely eay one a day. 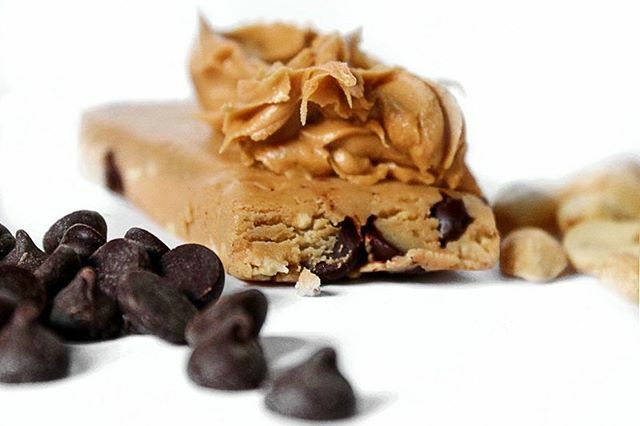 If you’re eating a Quest Bar, you really shouldn’t have one more than once a week. Can I trust nutrition labels? Aside from bars I recommend on this site, no. Protein bar manufacturers are notorious for lying to consumers. Many popular keto and low-carb protein bar manufacturers use synthetic fibers and sugar alcohols that are only partially indigestible and yet they subtract every gram of carbohydrate from the net carb count, listing a number that is much lower than it actually is. Offending synthetic fibers include Isomalto-oligosaccharides, which has been shown to contain about 50% digestible carbohydrates. In the case of sugar alcohols, many bars contain Maltitol, a common ingredient in low sugar candies – and the worst offender of all. Bottom line: if a low net-carb count in a suspiciously sweet bar seems too good to be true, it is. Watch out or you will be out of ketosis before you know it. What common sugar alcohols should I avoid? Malitol: This is the most common sweetener in sugar-free candies, and it’s considered to be the worst sugar alcohol. It actually has 2.5 cal per gram and a glycemic index of between 35 and 60. It’s been known to reach a glycemic index of up to 65 in concentrated syrups, like those used in many Atkins diet foods. Not to be consumed on a regular basis! Avoid this, but if you must, add about 50% of Malitol carbs into your net carb count. Erythritol: With a glycemic index of zero and just .2 cal per gram, erythritol is by far the best option of the sugar alcohols. I still prefer natural zero calorie alternatives such as Stevia and Monk Fruit. Allulose: Allulose is a new synthetic sugar (not technically a sugar alcohol) that was created by QUEST Nutrition. They’ve dubbed it a “rare sugar“. It’s not clear what this means but that’s how it is described on the back of some newer Quest Bars, such as the Hero Bar. Some consumers are reporting that it tastes good and is easy to digest, while others are saying it’s overrated. Given QUEST Nutrition’s poor track record, I’m avoiding Allulose until it’s proven to be safe. 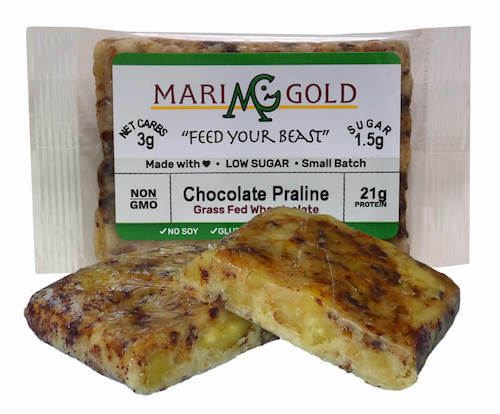 Please note: Select MariGold Bars are available on Amazon, but they cost more AND the $10 discount (promo code HFB10) only works on the MariGold Bars website. You’ll also get the fastest shipping when ordering direct.